The Saxon Switzerland National Park is one of the most beautiful places for landscape photography in Germany. It covers an area of 93 square kilometers and is located between Pirna and the Czech border. The region is shaped by sandstones, formed from depositions that accumulated on the bottom of the sea millions of years ago. The constant change between these remarkable mountains, ravines and areas of forest makes the National Park highly attractive for photographers from all over the world. Bastei – The Perfect Spot for Landscape Photography? 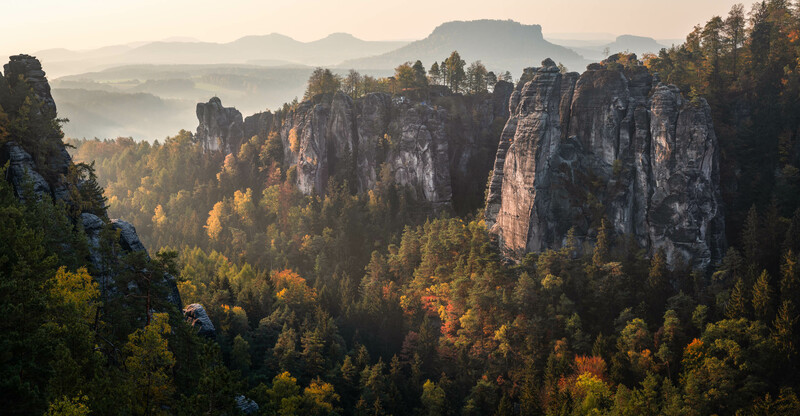 The most popular attraction in the Elbe Sandstone Mountains is the Bastei. The rock formation towering 194 meters above the Elbe River is the major landmark of the Saxon Switzerland National Park. A bridge connects the sandstones and makes the formation accessible for tourists. There is no entrance fee and you are within walking distance to the car park nearby. Most photographs are taken from a small lookout on the Ferdinandstein. 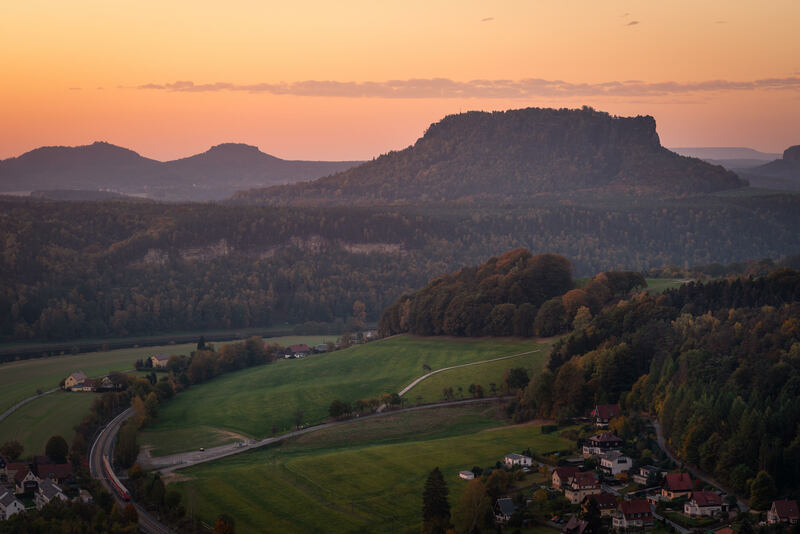 The popular panorama offers a great view over the Bastei and the surrounding table mountains (Lilienstein, Königstein Fortress, Rauenstein). If you are looking for an outstanding image, visit this place in autumn. The colorful leaves, some early morning fog and a visible sunrise can create an unbelievable atmosphere. 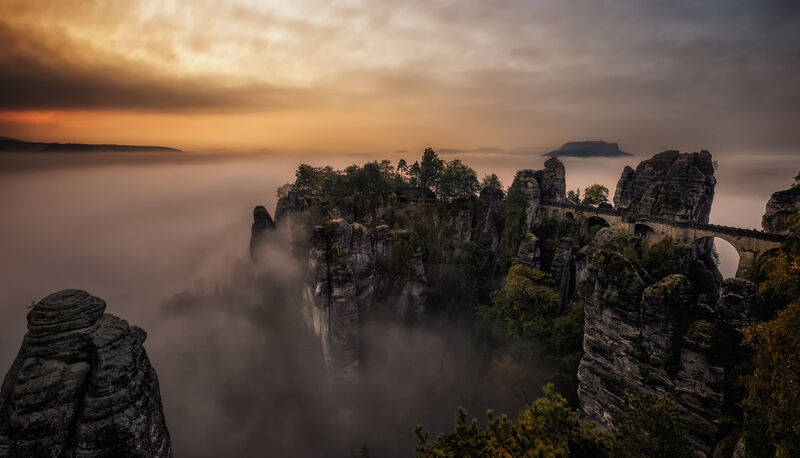 Saxon Switzerland National Park: foggy morning at the Bastei. The Bastei Bridge is a great location for landscape photography in autumn. Still, you should be aware of what you are getting yourself into. Let me give you an example: the shot above was taken in 2016 under nearly perfect conditions. On top of that, I met two other local photographers and had an interesting conversation about the Saxon Switzerland National Park. A perfect morning! In October 2018, I had to experience that a lot of things have changed. More than thirty photographers were fighting for the best photo spots around the Bastei Bridge. It was not possible to find a place for yourself, not to mention the aggressive atmosphere of the people standing in each others frame. And please don’t get me wrong, everybody should get the possibility to photograph this location. But if you want to enjoy a sunrise peacefully, take your time and explore the other 92 square kilometers of this fantastic National Park. Peaceful atmosphere: Sunrise over Rathen. A few years ago I wrote an article about the negative aspects of Social Media Platforms. And still, Instagram, Pinterest, Youtube and Co. highly influence our social life. They grant us easy access to thousands of magnificient images and locations around the world. On the downside, people start copying these photographs instead of creating new perspectives. A reasonable process, considering that it’s the easiest way to get a great composition. Nevertheless, it feels good to break out of this circle and create something new. The region around the Bastei offers much more than just one perspective. I highly recommend following some hiking trails (for example the Malerweg Trail) while looking for different points of view. It’s worth it! 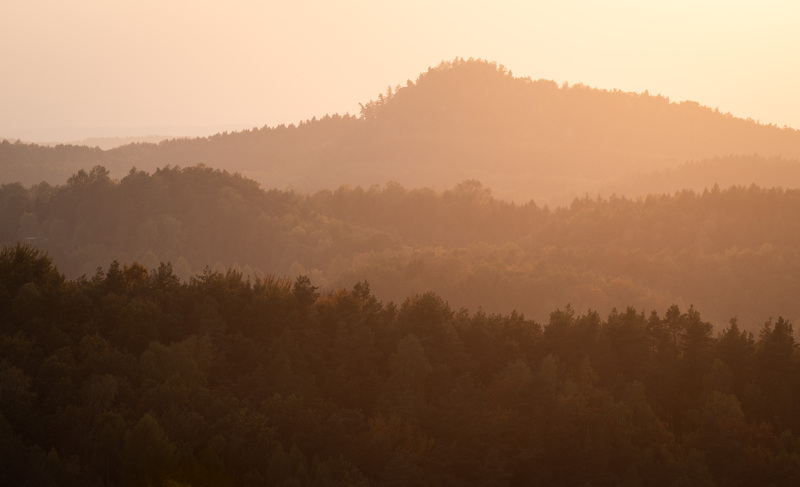 New Perspective: Morning Light in Saxon Switzerland National Park. I already mentioned that the Elbe Sandstone Mountains provide plenty opportunities for landscape photographers in autumn. One of my personal highlights is the Gohrischstein, located right next to the village of Gohrisch. It’s a twenty-minute walk from the car park to the top of the table mountain. The 360°view from above is outstanding and not as crowded as other popular locations. More recommended photo spots: Lilienstein, Schrammstein Lookout, Carolafelsen, Papststein, Pfaffenstein, Wehlstein Lookout and the Kipphorn Viewpoint. Recommended Photo Spot: Golden Sunset at Gohrisch. Last but not least: Creativity. Don’t hesitate to try unusual compositions. Landscape Photography in autumn offers thousands of different colors, levels and unique structures. Example: Put your wide angle lens aside and explore the region with a tele lens. Example: the following shot was taken with my Pentax 150-450mm. Give it a try and explore the Saxon Switzerland National Park in your own unique way! Creative Structures: Levels in Landscape Photography. Your article outlines the main problem of landscape photography in 2018. There are too many Youtube Tutorials and Instagram postings about the “best” photo locations. I highly agree with your opinion. Great article and impressive pictures! 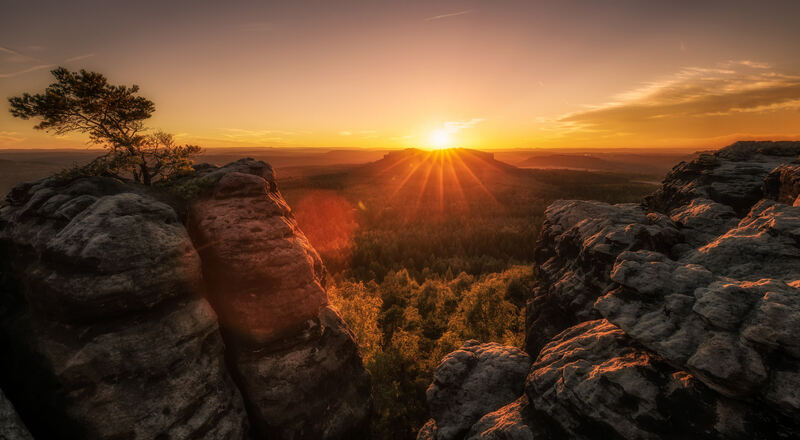 Thanks for sharing these insights from Saxon Switzerland Lukas! Lovely photos! I didnt know that germany has so many beautiful places for landscape photography. Thanks for sharing! Hey Lukas, it seems like you are a great landscape photographer. These images of Saxony Switzerland are beautiful. I will visit this place next year with my family and take some shots for myself! I concur with your experience at the Bastei view points. I was there last Sunday because the weather forecast was good (and I live in Dresden, so it’s a quick drive there) and was surprised about the number of headlamps I saw flashing through the dark – there seemed to be photographers everywhere. I hadn’t expected this, but was lucky to run into a very nice lady who took me with her to her favorite spot and we were the first to arrive there just after 6am. I was totally engrossed in taking pictures and when I turned around I saw that photographers were now standing 3 rows deep behind us, with some of cellphone tourists from the hotel queuing down the stairs of the viewpoint.